Finally finished reading the famous “The Art of Game Design: A Book of Lenses” by Jesse Schell. Jesse Schell is a professor at CMU ETC (which happens to be my dream graduate school :D) and an experienced game designer. Throughout the book, he often explains some abstract concepts by his actual experience in game designing (especially from the game Pirates of the Caribbean: Battle for Buccaneer Gold and Toontown Online which he designed) and performance art (he was a juggler during his teenage years). Different from many of the “Game Designing” books, The Art of Game Design aims purely at game designing, meaning the book is more about the creative process, mechanics design principles, and brain storming methods rather than game development (programming) and game art (graphics & music) design. What is novel about my game? Does my game have novelties throughout or just at the beginning? Do I have the right mix of the novel and the familiar? When the novelty wears off, will players still enjoy my game? Simply by asking yourself those questions when you design your games, you will know better about what your game is about and what you are trying to achieve in your games. Also, the author made all the lenses into a deck of cards, so you could shuffle them, examine them randomly, or do whatever you want with these cards (you can download the cards on Google Play, App Store, or get a real card deck on Amazon). The second cool feature of this book is that every chapter is a single statement which adds elements to the whole game designing map. 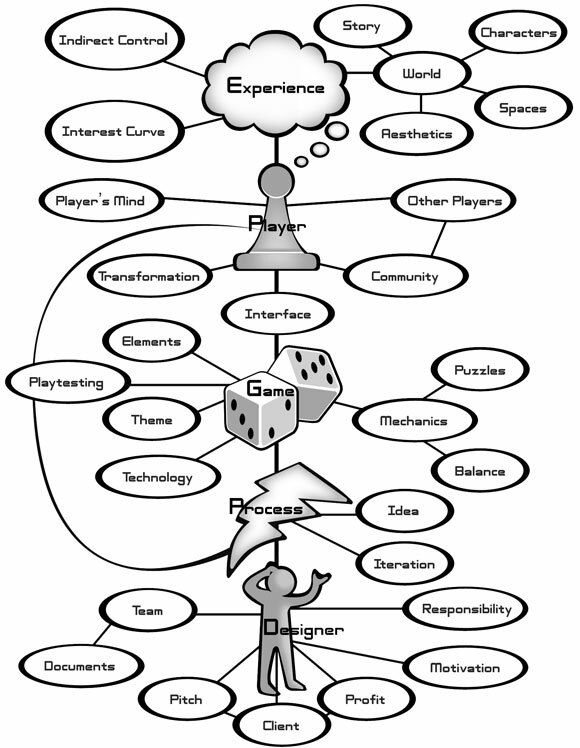 For example, chapter 2 is “The Designer Creates an Experience”, chapter 10 is “The Experience is in the Player’s Mind”. The book first begin with the game designer herself, the game experience, then the game itself, game world, and lastly the game development team. Below is the entire game designing map (Schell, pg. 527). I strongly recommend that you first finish designing a game before reading the book or design a game while reading the book so that you could dissect and analyze your own game by applying the lenses when you go through the pages. As far as I’m concerned, I started reading the book right after completing and publishing my first game kQq (sorry for the self-promotion…), so I have fresh memories about the decisions I made when designing the game. I’ll share some of the ideas I found inspiring in the book. This tip is useful for all artistic creation, but especially for game design. When player plays a game, they are enjoying the experience instead of the game itself. The experience is in the players mind, so different people could have drastically distinct experiences when playing the same game. So how could game designers design enjoyable experiences which dwells in players mind? The most convenient way is to analyze and observe the designer’s own experiences. In other words, ask yourself why is it enjoyable (or sad, angry, etc. ), and how it makes you feel that when you are playing a game, watching a movie, reading a novel, etc. Though it is very difficult to observe your own experience and you may lost that specific experience when you stop and observer it (Schell take Heisenberg’s Uncertainty Principle as analogy), by practicing and trying, you would be better at it and you would know better how to make people have that certain experience. The previous point is about observing your own experiences, that is, listening to yourself. This point, on the contrary, is about listening to the players of your games. When designing a game, you should constantly imagine what your players would think when playing, how would a certain design affects the feeling of a player, and how would the players play your games. For example, I really like the concept of “game venue” in the book, which categorizes games into different types by the venues they are more likely to be played in. Being a designer, you should think of where the players would play your games, and design your games accordingly. Schell states that a game is built by a tetrad of technology, aesthetics, story, and mechanics. All of the four basic elements should support a theme, and you should use every means possible to reinforce the theme. Take the popular survival game Don’t Starve as an example, the developers go to the extreme that they don’t include any kinds of tutorials in the game, players have to find there way to explore the world, and manage to stay alive. Since it is a survival game, this mechanic – that is, having a game without tutorials – successfully supports and enhances the main theme. Come up with a basic design. Figure out the greatest risks in your design. Build prototypes that mitigate those risks. Come up with a more detailed design based on what you have learned. Only by looping through the cycle again and again could a good game be made. This also means that there are no such thing as a perfect game, you can always make a game better if you go through another iteration cycle. You should definitely grab a copy of The Art of Game Design: A Book of Lenses if you’re interesting in game designing or you want to know how games are designed. Here’s an Amazon link to the book.